Indian Oil Corporation Limited (IOCL) Bongaigaon Refinery Recruitment 2018 August – Part Time Specialists Posts :- One of the Leading Organization of Assam Indian Oil Corporation Limited (IOCL) Bongaigaon has published a recruitment notification in the month of August 2018. According to the latest IOCL Bongaigaon Recruitment 2018 August Notification , Indian Oil Corporation Limited, Bongaigaon Refinery requires part time Specialists on contract basis, initially for a period of Six months effective from September. 2018, which may be extended / reduced at the sole discretion of the Management. We have detailed report about this recruitment mentioned in below section. 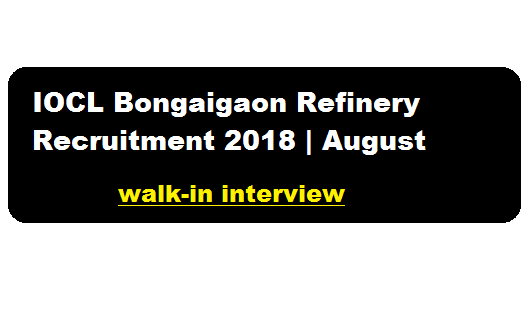 In this section, we will discuss in detail about Recruitment of part time specialist Posts under IOCL Bongaigaon Refinery Recruitment 2018 with all the details and requirement. Note: Candidates with additional qualification & experience may be given preference. However, discretion of the Management would be final. The terms & conditions of service like remuneration, work conditions / timings etc. will be discussed at the time of interview. Interested candidates fulfilling the above mentioned criteria may appear in a Walk-in-Interview on 26.08.2018, Sunday from 9AM to 2PM with all the relevant educational certificates & post qualification work experience documents (original & one set self attested photo copy along with two recent coloured passport size photographs and valid identity proofs) at BGR Hospital, IndianOil Corporation Limited, Bongaigaon Refinery, BGR Township, PO. Dhaligaon, Dist. Chirang, (Assam). Pin: 783385.